The much anticipated release of Quietdrive's "Even When I'm Gone" will finally be available at midnight tonight! Get it at i-Tunes or Amazon. Tell your local radio station to pick it up on Play MPE because you want hear it! BUY IT NOW at i-Tunes or Amazon. September is almost upon us and as most of you know September is National Childhood Cancer Awareness Month. 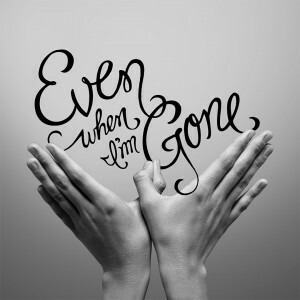 We are EXCITED to announce that Quietdrive's release of "Even When I'm Gone" written in Kendal's honor is scheduled just in time for September 3rd!. Stay tuned! Proceeds from the song will benefit Pediatric Cancer Research through Children's Cancer Research Fund! Well it's almost here. 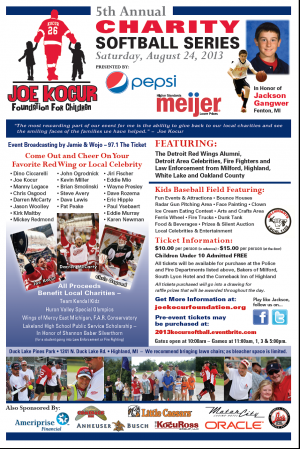 Need tickets - We've got em! Contact us at info@teamkendalkidz.org. Our annual Charity Concert at the Royal Oak Music Theatre will be held on Saturday September 7th this year! 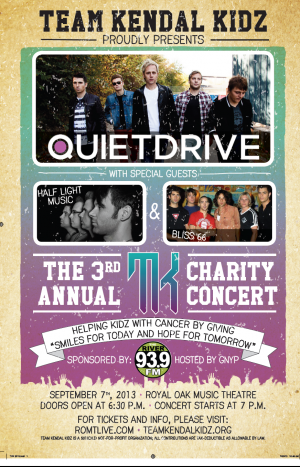 Quietdrive will be returning with a special song in Kendal's honor with special guests Bliss 66 and Half Light Music. It's TOMORROW!!!! Don't let a few rain drops scare ya, we've got you covered! (literally the tent is large and sturdy! ) Rain or shine we will be partying away at the BWW Big Tent Event. Come on out and Help Team Kendal Kidz Give Kids SMILES For Today and HOPE For Tomorrow. Check out our event page for more information. Don't forget we will be debuting Quietdrive's song they wrote in honor of Kendal. See you there! Just wanted to let you know that the Team Kendal Kidz Charity Concert at the Royal Oak Music Theatre will now be held on Saturday September 7th. Please make note of this change. See you all there! 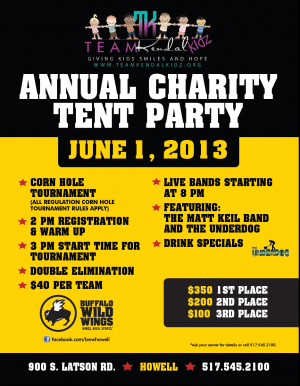 Don't forget the Buffalo Wild Wings Big Tent Event is coming up quick on Saturday June 1st! LOTS OF THINGS HAPPENING THIS SUMMER! Where to begin............For starters Buffalo Wild Wings in Howell will be selling our pin-ups the entire month of May. Check out our pin-ups page for more information. Your Research Dollars At Work! This will definitely Give Kidz HOPE For Tomorrow! Hartland Bone Marrow Drive Was A HUGE Success! Saturdays drive at Hartland High School was a HUGE success! Thank you Frank Shinkonis for believing in this cause and making it happen. Thank you to all of the Hartland teachers and educators who helped make this possible and thank you to ALL of YOU who registered. Someday a life will be SAVED because of YOU! 82 people are now officially registered and willing to donate bone marrow to someone dying of blood cancer. Team Kendal Kidz is a 501(c)(3) not-for-profit organization; all contributions are tax-deductible as allowable by law.